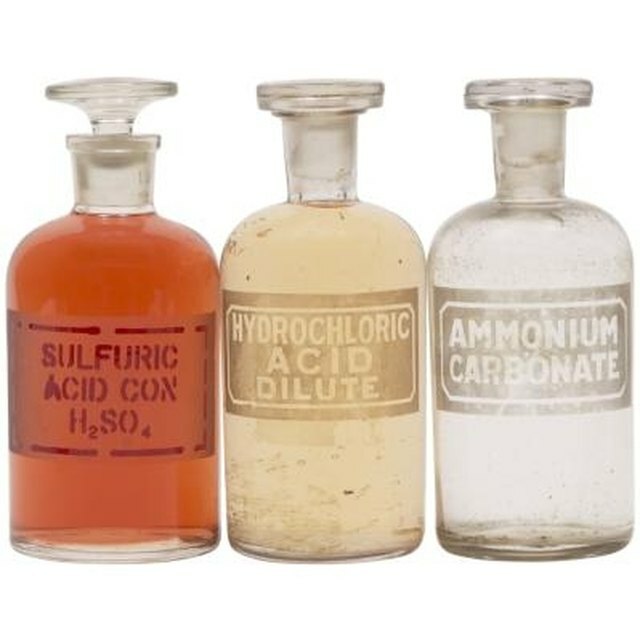 A simple litmus test can tell you whether a compound is acidic, basic (alkaline) or neutral. It is slightly more challenging to figure out how acidic a compound is in relationship to another. You can use a pH meter in samples that may be diluted or examine the chemical structure to determine which compounds are more acidic. Determine the charge of the molecule. Positively charged molecules, or ions, are more acidic than neutral ones. Negatively charged ions tend to be basic. Examine the periodic table of elements to figure out the strength of the electronegativity. The further to the right on the periodic table the element bonded to the hydrogen is, the stronger the acid it makes. Find the size of the base of the atom as compared to the others. Larger atoms are closer to the bottom of the periodic table, while smaller ones are closer to the top. Compare the differences in molecular structure. The closer the negative ion is to the H+ ion in the molecule, the stronger the acid is. Look at the strengths in the bonds between the molecules in the ion. The more lopsided it is throughout the molecule, the stronger the acid. A molecule with a triple bond is more acidic than one that only has single bonds. If you still feel unsure about the relative strength of the acid, check your findings with a pH meter. Robert, Marissa. "How to Determine Which Compound is More Acidic." Sciencing, https://sciencing.com/determine-compound-acidic-5798566.html. 13 March 2018.